Pillow Tek Side Sleeper Ultra Cooling Gel Pillow Review - Does Better Support Mean Better Sleep? 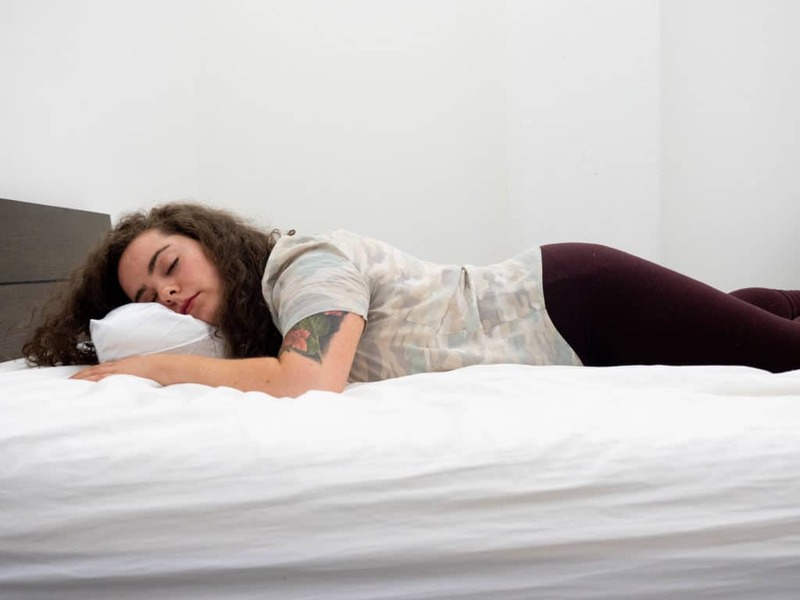 Side sleepers tend to require a pillow with some lofty, firmer support in order to keep their spines in neutral alignment and relieve pressure in their shoulders. Surveys have indicated that the majority of the American population sleep in some lateral style, but without the proper support it’s very easy to curl up into an unhealthy position. That being said, while it’s important for sleepers of all styles to find the right bed accessories, I’m going to take a closer look at the needs of side sleepers. The Side Sleeper Ultra Cooling Gel Pillow from Pillow-Tek was designed specifically to help side sleepers rest cooly and comfortably all night long. It’s firm, narrow design was built to be tucked right into that below-the-chin nook so that folks in the lateral position are held in a neutral posture, and their shoulders rest comfortably atop the mattress. Wrapped in cooling gel, this pillow was designed to keep side sleepers cool for a deep slumber. 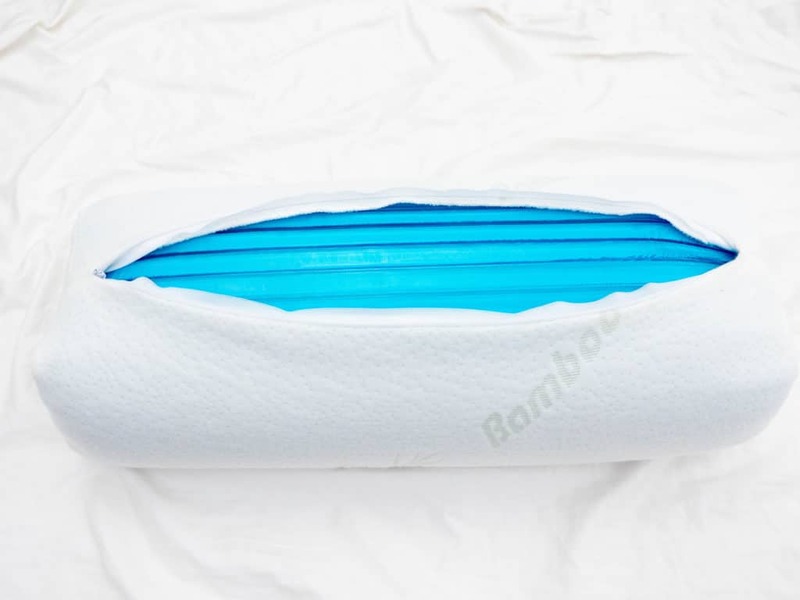 In this review, I’m going to take a closer look at the cooling properties of this pillow, as well as find out what makes it so great for side sleepers. And I’ll test it from every position just to be sure that we aren’t missing any untapped position potential! No time to read this whole article? Click here to skip to the review summary! This pillow has a medium-firm foam core designed to offer supportive pressure relief specifically for side sleepers. It’s tightly wrapped in cotton to help keep the foam compressed. A cooling gel pad wraps around the foam core to enhance the weight and loft of the pillow as well as draw heat away from sleepers’ bodies. This way, they can stay cool all night. The pad is removable so that users can wash it according to the care instructions included. Once you’ve wrapped the foam core in the cooling gel pad, it’s zipped up in a cover made from bamboo. It feel super soft to the touch, and its natural moisture-wicking properties enhance the cooling features of the pillow. After the pillow has been covered in the bamboo case, sleepers have the option of dressing it with a cotton pillowcase or a silk one. Both come with the purchase of every Side Sleeper Ultra Cooling Gel Pillow. This pillow’s narrow, cube-shaped design was built to be closely tucked under the neck, offering side sleepers balanced pressure relief. The entire design of this pillow was intended to provide evenly distributed support for side sleepers, as well as keep them cool throughout the night. This pillow feels right in the middle of medium-firm to firm, and its layering of materials enhances the loft, weight, and overall firmness. It’s tightly compressed in a cotton sleeve, and then wrapped in a thick, cooling gel pad. Once it’s been snugly wrapped in the gel, it’s stuffed inside a bamboo cover which is then dressed in a pillowcase. This compressed layering of fabrics creates a balanced distribution of pressure relief so that side sleepers can feel evenly supported. When you press into the pillow, you can feel the firmness pushing back and you can tell it will not lose its shape over the course of the night. The shape of this pillow was built to be narrow and rectangularly cube-shaped so that side sleepers can wedge it between their heads and shoulders. This way, the neck is positioned to be in line with the spine, and some pressure is relieved from the sleepers’ shoulders. The Side Sleeper Ultra Cooling Gel Pillow helps users to maintain healthy posture, but it also draws heat away from the body via the gel pad inside. If you are more into the deep sink of memory foam or the fluffy foldability of feathers, you might not be as compatible with this particular pillow (especially if you’re not a side sleeper). 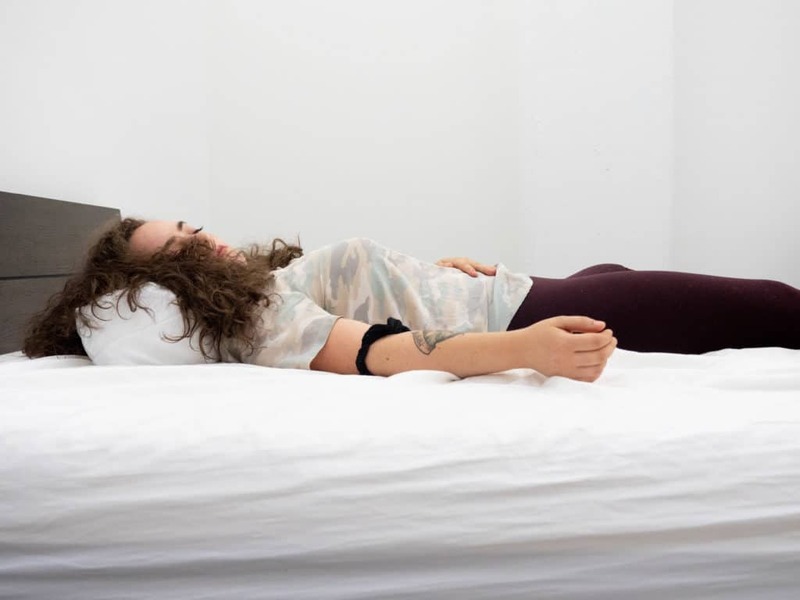 The entire feel and support of this sleep accessory was designed with lateral sleeping in mind. Folks who sleep on their sides often require a lofty, firm pillow without too much shapeability to offer posture support. I am, most frequently, a side sleeper. So, seeing the words “SIDE SLEEPER” displayed on multiple parts of this pillow’s box made me feel chosen and ready to get into some lateral sleeping. Each Side Sleeper Ultra Cooling Gel Pillow comes with a cotton pillowcase and a silk pillowcase, and since curly hair plus summer humidity equals chaos, I went with the silk. I started, of course, on my side and as soon as I tucked the pillow under my neck, I could feel my spine align. I have to say: the pressure relief was notably immediate with this pillow and I felt so securely supported. My posture felt very healthy I didn’t feel like my shoulder was bearing the brunt of any weight. Testing out the side sleeper pillow from Pillow-Tek the way it was meant to be used… On my side. I definitely got the sense that I could sleep for 10 full hours on this pillow and wake up in the exact same position as when I dozed off. The medium-firm feel kept my head and neck supported and I never felt the pillow lose its loft or shape at all. The way the pillow is so tightly compressed definitely served to keep it just as lofty and firm as when I took it out of the box. While this pillow is clearly designed for side sleeping, I was a little rebellious and tested it out in other positions as well. Sure enough, though, none of them provided me the comfort I look for in other positions. It was too firm for back sleeping, too lofty for stomach sleeping, and too short and narrow for under-the-arm and between-the-leg support. Ah, well. Can’t say I didn’t try! So, I moved back into the lateral position to end my journey with this pillow on a high note. As I slid back into side sleeping, I realized that I didn’t feel this pillow trapping my body’s heat. I had been so comfortably fixated on how aligned my neck felt, that I almost forgot to take note of the cooling features. I’m a hot sleeper, and many pillows (like memory foam and down, for example) seem to trap my heat and make me even warmer. The cooling gel pad wrapped around this pillow really seemed to dissipate the heat from my body and keep me comfortable. I wouldn’t say it felt cold at any point, and I didn’t feel that icy coolness that the Bear Pillow offered. Frankly, I think the silk pillowcase counteracted some of the cooling effects and sleepers might be better off disregarding the pillowcases completely and just enjoying the soft, breathable bamboo that lies beneath. 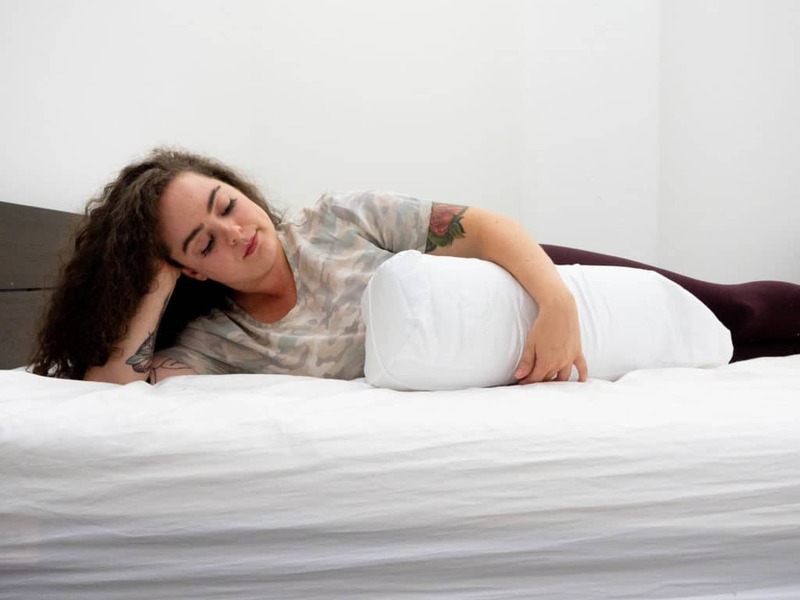 Ultimately, this is definitely a side-sleeper-only kind of pillow — but hey, we side sleepers need all the support we can get! Different Heights — This pillow comes in two different heights to accommodate shorter and taller side sleeper. Shorter folks choose the 4.5” and taller sleepers choose the 6.5”. Wash Instructions — The core of this pillow must be dry cleaned only. The gel pad must be hand-washed with cold water and mild detergent. Everything else can be thrown in the washing machine on a cold, delicate cycle. Cooling Gel Smell — I didn’t experience it, but the folks at Pillow-Tek say it’s not uncommon for the gel pad to have a temporary odor when first unboxing the pillow. SHOULD I TRY THE SIDE SLEEPER ULTRA COOLING GEL PILLOW? 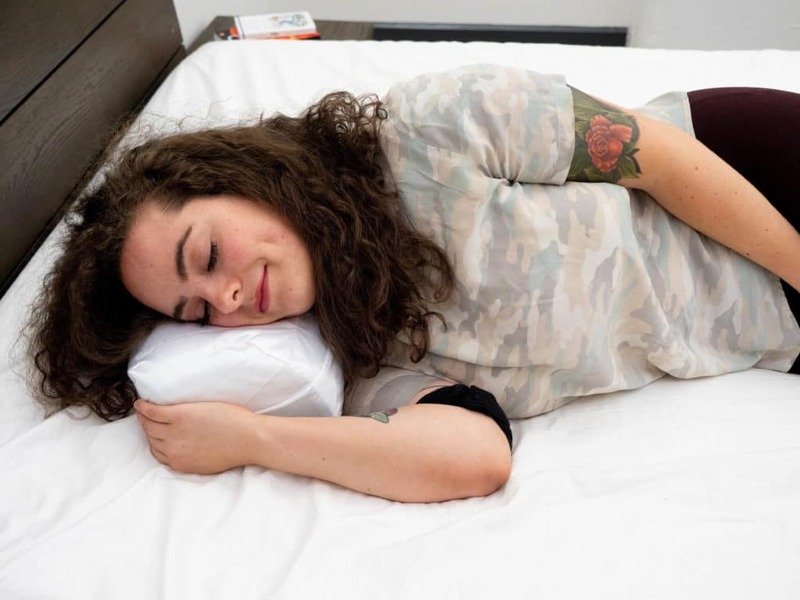 Sleeps Hot — If you’re prone to night sweats, the cooling gel pad in this pillow was engineered to draw heat away from your head and help keep you cool. Loves Firm Support — This pillow has a compressed, firm feel in order to offer even pressure relief for folks sleeping in the lateral position. Wants Pillowcase Options — This pillow comes with both cotton and silk pillowcases, so sleepers can switch back and forth depending on which material best suits their fancy. Not to mention, the bamboo cover fabric is soft and moisture-wicking! Head over to Pillow-Tek to pick up your Side Sleeper Pillow!